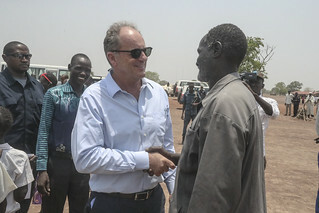 Excited little voices chant welcome messages as the head of the UN Mission in South Sudan (UNMISS) arrives at Mayen Gumel Primary School, located in the town of Kuajok, in northwestern South Sudan. Some have those messages written on little paper placards, while some have gone an extra mile to draw a portrait of the head of UNMISS. “His name is David Shearer, the head of UNMISS,” says Paul Manyeng Deng, the artist. “We are very happy to see the SRSG [Special Representative of the Secretary-General],” he adds. “I see the doctors have [done] good things to the people. When a person [is about] to die, a doctor can come and help him,” he says. “The future of youth is very important for us in South Sudan,” said David Shearer, Special Representative of the Secretary-General and head of UNMISS during his two-day visit to South Sudan’s Greater Bahr El Ghazal and Warrap regions. Located in Gogrial, Mayen Gumel Primary School was recently renovated with support from UNMISS, under its Quick Impact Projects. The school has registered unprecedent numbers in the enrollment of girls, who are now at 396 out of the total number of 831 pupils.